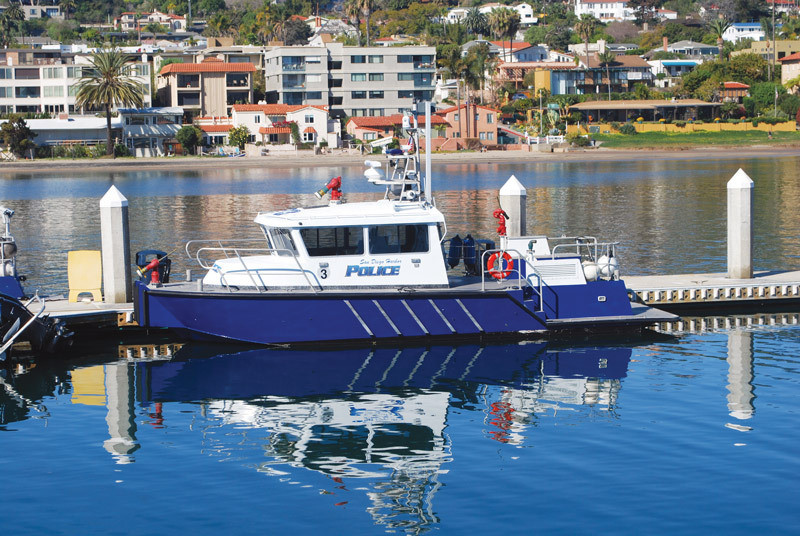 SAN DIEGO — Dozens of marina operators and maritime interests met with officers of the San Diego Harbor Patrol at its headquarters on Shelter Island Feb. 3 to discuss how to monitor suspicious activity as part of the port’s iWatch My Bay program. Harbor Patrol officers and one Department of Homeland Security agent made presentations om what indicators could be red flags for maritime smuggling of drugs or humans. Colon added the Harbor Patrol considers marinas and waterfront structures to be critical infrastructure, meaning such venues could serve as targets for criminal or terrorist activity. He provided specific examples of arrests and seizures made by his department where boats were loaded with undocumented immigrants or large quantities of drugs. Maritime smuggling indicators, according to Colon, could be classified as either a covert or overt threat. Overt threat indicators are whenever a criminal activity occurs in the open, and no attempts are made to hide from authorities or blend in with the public. An indicator of an overt threat would be a Panga boat cruising in the ocean and attempting to smuggle humans or drugs into the United States from Mexico or other countries. Conversely, covert threat indicators are difficult to discern or notice, as smugglers attempt to blend into everyday life by traveling in common boats and using the same routes as everyday boaters. Since covert threat indicators are difficult to notice, Colon offered marina operators a few tips on what to pay attention to and whether to call law enforcement. Whether a vessel is overloaded is one possible indicator of suspicious or criminal activity. Colon advised marina operators to pay attention to a vessel’s motion through the water. The natural motion of a vessel’s front end, as it traverses through the water, is to bob up and down. However, if a vessel plows forward and pushes water without bobbing, Colon said it could be possible the boat has a large load of drugs or humans is aboard. Another example of a covert threat indicator is inadequate or incorrect fishing gear, which could be a façade. For example, does a vessel have small gear but is heading out to sea to fish for marlin? Taking freshwater tackle to the Pacific Ocean would be another red flag. A disabled vessel or its captain and crew appear to be lost or unfamiliar with their way around the marina also is a covert threat indicator, Colon said. For example, a captain who fails to properly plan how much fuel he or she would need for a long-range trip could be a red flag. Abandoned vessels could be a covert threat indicator, especially if Mexican newspapers or soft drink bottles with Spanish text are found aboard. Marina operators should pay attention to anyone on lookout, either aboard a boat or on marina property. Colon said individual acts are rarely criminal activity. Accordingly, marina operators should consider the bigger picture when noticing lookout activity. For example, is someone making and receiving multiple cell phone calls, ?especially when a vessel enters a marina or law enforcement increases its presence? Other actions to notice include the amount of time a person has spent occupying a space at the marina, whether the person is spending significant time in a strategic vantage point or if the area is popular or isolated. Finally, Colon recommended marina operators pay attention to structural changes made to a vessel, such as oddly placed equipment or a boat with an upgraded interior but dilapidated exterior. In addition to boats, law enforcement officials are now paying attention to personal watercraft such as jet skis. Since San Diego is close to Mexico and some criminal cases certainly lead investigators to points due south, federal law enforcement officials complement the Harbor Patrol’s monitoring of illegal activity in California’s southernmost bays and marinas. Special agent Daniel Trovillion of the Department of Homeland Security attended the Feb. 3 iWatch My Bay meeting on behalf of federal law enforcement and told marina operators his investigations focus on criminal activities that lead him and his colleagues to the sources of drug and human trafficking in Mexico and South America. “Our job is not to go out and arrest someone in violation of local ordinances. We’re trying to interrupt and dismantle larger organizations,” Trovillion said. He emphasized the significance of marina operators and port tenants serving as the eyes and ears of their respective venues and keeping federal and local law enforcement officers up to date on what is happening. “You guys are the eyes and ears. You guys know your environment. There aren’t enough officers [to keep an eye on everything],” Trovillion said, focusing on the “See Something, Say Something” element of iWatch My Bay. Colon added response times would vary depending upon each situation, but marina operators or port tenants should not hesitate to contact Harbor Patrol if they notice something suspicious. Officers will look into every inquiry, Colon said. Both Colon and Trovillion said once an inquiry is placed, officers will determine whether there is a real threat. Other criminal activities Harbor Patrol officers urged marina operators to pay attention to included bicycle and fishing pole thefts. To report suspicious activity, call (619) 686-6272 or email iwatch@portofsandiego.org.